“With each passing year, engineers are getting closer to recreating the 3D interface technology that pop culture has rendered so clearly for decades. 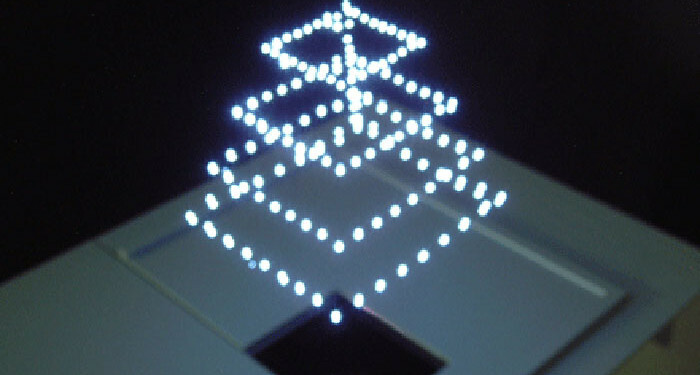 Just last fall, a Japanese company called Burton Inc. unveiled a system that used lasers to create 3D displays in mid-air which, Burton said, could be used to notify people of emergencies. Now we’re seeing the evolution of that technology—but it’s definitely not being used to warn anyone of impending disasters. It’s being used as UI. A paper submitted to SIGGRAPH—short for the Special Interest Group on Graphics and Interactive Techniques, which takes place in LA at the end of the summer—details how a group of researchers at the Digital Nature Group at University of Tsukuba managed to create small-scale holograms that are actually haptic and interactive—meaning you can feel them when you touch them. The team calls these holograms “Fairy Lights,” but the technology they used is definitely less whimsical. The project uses a femtosecond laser—that is, a laser that emits pulses at super-fast, super-intense paces (for the record, a femtosecond is just 1/1,000,000,000,000,000 of a normal, eternity-spanning second). The pulses “excite” matter to create “voxels” of light, formed to draw 3D holograms at a resolution of “4,000 and 200,000 dots per second,” the authors explain. Those brightly glowing voxels (pixels in three dimensional space) are air molecules that have been ionized at the focal point of an infrared laser and are releasing extra energy in the form of bluish-white photons. To learn more about the light spectrum and frequency of biophotons, including how the body can be measured for biophoton emissions, please visit: How Bioenergy can be Measured.